A statue to former U.S. President Ronald Reagan was unveiled in downtown Tbilisi by President Saakashvili and the U.S. congressional delegation on November 23 with the Georgian leader saying at the ceremony that the statue was symbolizing the difference between the ideologies of Georgia and its northern neighbor. 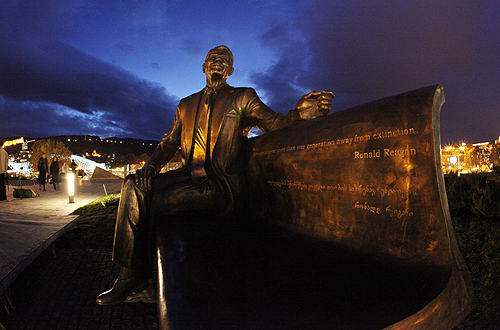 The bronze statue, depicting a smiling Reagan sitting on a bench with crossed legs, was unveiled in the Rike Park. “Leader of our invader state has announced that the collapse of the Soviet Union – the Soviet Union which was collapsed by Ronald Reagan – was the 20th century’s biggest geopolitical catastrophe,” Saakashvili said during the unveiling ceremony, referring to Russia’s PM Vladimir Putin. “Several days ago in the north from us creation of Eurasian Union was announced, which has been bluntly declared to be a new version of the Soviet Union,” Saakashvili said. He said that Russia’s attempt to restore the Soviet Union was “revenge” against what Ronald Reagan had done by helping to collapse the Soviet Union. “While they [Russia] have restored the anthem of the Soviet Union, we are unveiling a statue of Ronald Reagan in a sign of difference between our ideology and of theirs,” Saakashvili said. “No matter how many crusades they will declare for restoration of the Soviet Union and no matter how many prayers or curses KGB-uniform elements in the north from us will say, freedom will definitely prevail and any attempt of restoration of the Soviet Union will lead to further destabilization of Russia and will lead this state – which deserves much better fate – to the verge of collapse,” Saakashvili said. After the speech, he invited U.S. congressmen Republican David Dreier; Republican Ed Whitfield and Democrat Donald Payne, who are visiting Tbilisi on November 22-24, to jointly unveil the statue.